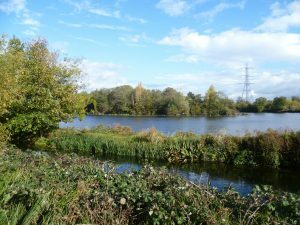 Recently, a friend and I visited the Walthamstow Wetlands, a new haven for birds and insects in north London. The story of how it came about is a very 21st century one – and, in these days of doom and gloom, very cheering. The A to Z of Victorian London from 1888 shows the River Lea meandering through marshland. 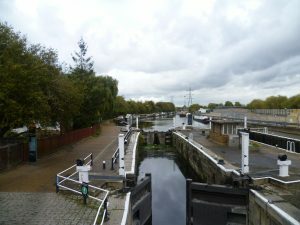 An 18th century stretch of canal called ‘River Lea/Lee Navigation’ (the spelling varied) had been dug to bring goods from the country up to London, and, parallel to the canal, the Mill Lead powered several water mills, indeed, four mills are mentioned in Domesday Book. The area was good for fishing, and that was about it. One of the mills, later known as the Coppermill, (see below) was taken over in 1647 by John Samyne, a staunch Royalist, who produced gunpowder there in the 1st Civil War (1642-1651). Later, it metamorphosed into a paper mill, then a leather mill, and then a mill for crushing linseed for oil. In 1808, it was bought by the British Copper Company who expanded it hugely. The Industrial Revolution was gathering pace, and copper was a valuable material with a multiplicity of uses. The Company smelted copper in south Wales and sent the ingots to the mill via the navigable River Thames and along the River Lea Navigation. Here it was rolled into sheets and used to cover ships’ hulls among other things. In 1859, the Coppermill changed hands and was bought by the East London Waterworks. London expanded hugely in the 19th century and there was an urgent need for clean drinking water. 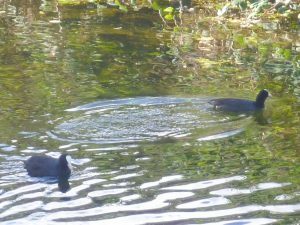 The Victorians, with their usual energy, set about doing something about it and the marshy Lea valley looked a promising area. Close up of island with the heronry. The white dots on the ring of posts are herons. A cormorant is standing guard on a bare branch on top of a tree. The red splodge to the right is a rose hip. Between 1852 and 1895, navvies hand-dug nine reservoirs here – a vast undertaking. The final reservoir, the huge 13 hectares Lockwood reservoir, was constructed in 1897, this time using steam-powered pumps, engines and cranes and fifty horses. The difference in manpower needed is staggering; the historian Terry Coleman calculated that a couple of steam excavators tended by twenty men could complete work which twenty years earlier would have taken 200 navvies. Gorse bush. 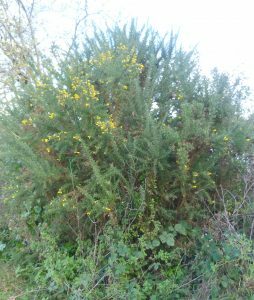 Country lore says: ‘Kissing is out of fashion when the gorse is out of blossom.’ Fortunately, gorse is always in bloom. In 1860, the East London Waterworks turned the Coppermill into a pumping station to pump water into the newly-constructed reservoirs and installed a Cornish steam engine called Victoria to do the job. Over the next forty years, a vast network of underground reservoirs, pipes, chambers were created under what became the Engine House to link all the new reservoirs together and to treat and pump drinking water to its customers. Today, it is the main source of water for 3.5 million people. Fast forward a hundred years or so. The 211 hectares Thames Water reservoirs are fully operational, and now use modern technology. 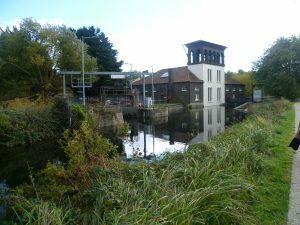 The Coppermill and the Engine House were still in use until the 1980s, but what to do with them once they had been decommissioned? After a lot of thought, money and hard work, the whole site has been transformed into an important wetlands centre, home for migrating birds. The Coppermill and the Engine House have been granted Grade II listed buildings status for their architectural features and their importance in local history. It’s a very 21st century solution to the problem of what to do with redundant industrial buildings and one where everyone wins, including the wildlife – and the visitors. 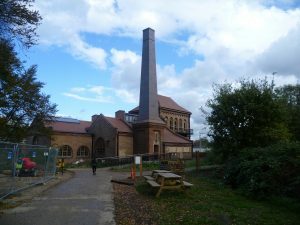 One of the things I like about the Walthamstow Wetlands centre is the clever way the Engine House has been adapted to its new purpose. Externally, the typical Italianate-style architecture – so beloved by Victorian builders of industrial buildings – remains much the same. The dramatic tall chimney makes a bold statement and the buildings have arched windows and steep-pitched roofs, more suited to a church. But I’m not knocking that. I have huge respect for what Victorian moral earnestness accomplished industrially. 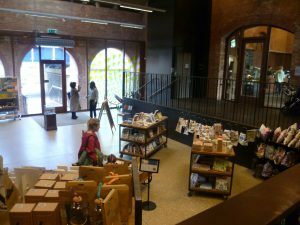 The Engine room has been gutted and, inside, there is now a central lobby area with an information desk, a small but useful shop, and a reception area. A few stairs leads to a pleasant café which has an outdoor decked area. There is also, a multi-functional education space, and a ‘Water and Life’ exhibition. 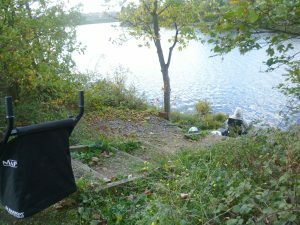 The fisherman has blocked the path going down to the water with his trolley to ensure that he’s not interrupted. A bit selfish? Perhaps he just needs to be alone. 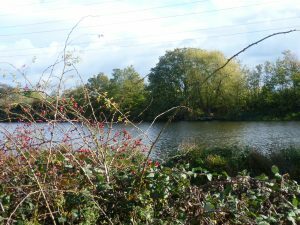 The reservoirs are all bordered by hawthorn, wild roses, gorse and various natural river bank plants like bulrushes, scabious, thistles and so on between the water and the public footpaths. The walker can see the water beyond, and there are places set aside for fishermen where you can get to the water’s edge but the priority is plainly to provide nesting places and cover for the wild life. 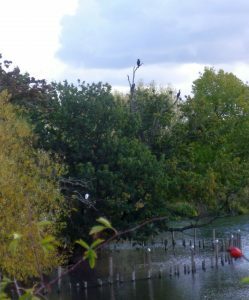 Most of the reservoirs have tree-covered islands in the middle, one of which has been home to a heronry for many years. 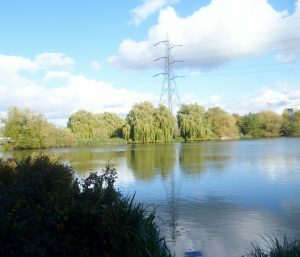 The Wetlands is not pretending that it’s in the country; there are places where you can clearly see a pylon or two, for example, or a block of flats in the distance. It was a chilly day in late October, and there weren’t many birds about. We saw some herons, a few gulls, a couple of cormorants, a couple of coots, and a pair of great-crested grebes. I suspect there will be more winter migrants in a month or so, and a lot more activity in the spring. Your posts are always educational, Elizabeth. The Victorians were amazingly industrious and inventive, something it took a long time for me to appreciate (being much more in tune with the 18th century). Love Rapunzel, and I am sure her hair would have been long enough too. That tower was pretty high. Thank you, Elizabeth. I reviewed a brilliant book a few years ago: ‘High Minds’ by Simon Heffer, who illuminates just how much the Victorians did in about 70 years: Factory Acts cut the working day from 12 hours to 10 max. ; child labour, e.g. chimney sweeps as young as 6, was abolished; a host of dangerous food additives were banned; women were allowed to keep their own earnings and own property; manhood suffrage came in – though it took 50 years before all men were entitled to vote; free and mandatory education came in for all children; London’s sewage system was built; the first railways were constructed; and that’s just for starters. Fascinating post, as always. Lovely to be guided by you through the changes in the area. Thank you, Jan. I’m sure there are enterprising people all over the country overseeing similar transformations. I met a gardener recently who is growing mushrooms in an old World War II underground air raid shelter – though, admittedly, that’s on a much smaller scale. Thanks for writing this interesting piece Elizabeth, it’s inspired me to read more about the history that you’ve mentioned. What was your source or sources for the historical information that you’ve referenced? Did you get these facts from a guide book for instance? Thanks again for your article and your help. Thank you for your comment on my Walthamstow Wetlands post, Tom. I found a lot of useful signage as I walked round the Wetlands, which I photographed. I consulted my ‘A – Z of Victorian London’, published by the London Topographical Society to find out what the area looked like in 1888; and I then did a lot of Googling. I also checked various people’s biographies in the ‘Dictionary of National Biography’ which I accessed using my local library card – most public libraries subscribe to the DBN which is really useful for research. All you need is a library card.